Car shoppers looking for a car with plenty of cargo space are turning to hatchbacks for the next vehicle, and for good reason. Hatchbacks are known for offering more practical trunk spaces than their sedan counterparts, allowing drivers to bring more of what they need with them to get where they’re going. 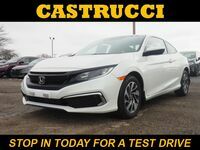 Honda’s entry in the hatchback class, the Honda Civic Hatchback, has been turning heads since its introduction and after a full redesign last year, the hatchback offers more of what car shoppers are looking for. So how does the 2017 Honda Civic Hatchback compare to class leaders like the 2017 Ford Focus Hatchback? 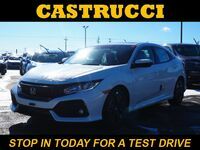 Our team here at Matt Castrucci Honda is putting it to the test with a detailed comparison highlighting the features and specifications of each. Read on for details! 94.8 cu. ft. Passenger Volume 90.7 cu. ft.
25.7 cu. ft. Cargo Volume 23.8 cu. ft. The 2017 Ford Focus Hatchback comes in five trim levels: SE Hatch, SEL Hatch, Titanium Hatch, ST Hatch, and RS Hatch. The 2017 Ford Focus Hatchback doesn’t offer nearly as many standard features as the 2017 Honda Civic Hatchback, with even the highest trim notably missing features such as leather-trimmed seating, heated front seats, a power moonroof, heated exterior mirrors, and a remote trunk/tailgate release that come standard on the 2017 Civic’s highest trim level, the Sport Touring. Additionally, the 2017 Focus Hatchback offers significantly less cargo and passenger space than the 2017 Honda Civic Hatchback, as shown in the chart above. The 2017 Honda Civic Hatchback also comes in five trim levels: LX, Sport, EX, EX-L Navi, and Sport Touring. All trim levels come standard with a 1.5-liter single-scroll turbocharged inline 4-cylinder engine, which can be paired with either a 6-speed manual or a Continuously Variable Transmission (CVT). 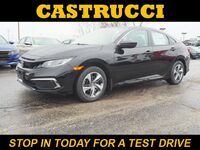 Standard features for all trim levels include automatic climate control, power windows and door locks, cruise control, Bluetooth® connectivity, Pandora® compatibility, hands-free SMS text messaging, and a touchscreen display. Standard safety features for all trim levels include Vehicle Stability Assist™ with Traction Control, the Anti-Lock Braking System, Electronic Brake Distribution, Brake Assist, a multi-angle rearview camera, the Tire Pressure Monitoring System, LED Daytime Running Lights, side curtain airbags with rollover protection, 3-point safety belts for all seating positions and dual-stage, multiple-threshold front airbags. 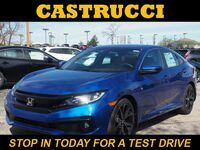 Car shoppers interested in learning more about the 2017 Honda Civic Hatchback are encouraged to contact a member of our team here at Matt Castrucci Honda. We’ll fill you in on all of the important details as well as answer any questions you may have. 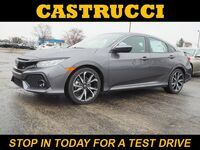 Drivers ready to get behind the wheel of the hatchback are invited to schedule an obligation-free test drive online or stop in and see us at our location in Dayton!